In this paper we provide an overview of the status of various colchicine derivatives in preclinical development with special focus on their anti-cancer activity. We discuss several groups of compounds that have been designed to differentially bind with specific affinities for tubulin β isotypes, especially in regard to βIII, which is commonly over-expressed in cancer. Computational prediction, protein-based and cell-based assays are summarized as well as some animal tests conducted on these compounds. It is concluded that an untapped potential exists for exploiting the colchicine scaffold as a pharmacophore with the possibility of increasing its affinity for tubulin isotypes overexpressed in cancer and decreasing it for normal cells thereby widening the therapeutic window. Abstract:In this paper we provide an overview of the status of various colchicine derivatives in preclinical development with special focus on their anti-cancer activity. 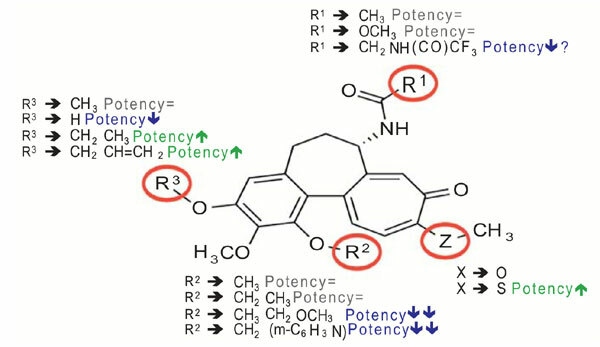 We discuss several groups of compounds that have been designed to differentially bind with specific affinities for tubulin β isotypes, especially in regard to βIII, which is commonly over-expressed in cancer. Computational prediction, protein-based and cell-based assays are summarized as well as some animal tests conducted on these compounds. It is concluded that an untapped potential exists for exploiting the colchicine scaffold as a pharmacophore with the possibility of increasing its affinity for tubulin isotypes overexpressed in cancer and decreasing it for normal cells thereby widening the therapeutic window.